Contact Us with your Cross-Dock needs. Neill Cartage and Warehouse in Chicago offers cross docking services to increase efficiency and reduce costs. Value-added storage services such as packaging, assembly, case-picking, sorting, re-packaging, labeling, collating, kitting and processing. 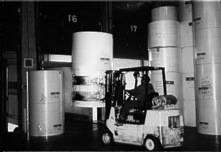 In logistics, cross-docking is a warehousing practice of transferring (or unloading) materials from an incoming tractor-trailer truck or rail car and then reloading these materials in another outbound mode of delivery such as semi-trailers or rail cars, with little or no warehousing in between. Cross docking is done to change the type of transportation being used, to sort materials intended for different destinations, or to combine material from different shipments. Cross-docking is used to decrease inventory storage by streamlining the flow between the supplier and the manufacturer.